The drain lines running through our homes and business buildings are vital to keeping us safe and healthy. When ANY drain clogs up, you realize how quickly it becomes an inconvenience, but also an unhealthy or damaging situation. Drains backing up anywhere can cause costly damage and large health concerns--you cannot afford to hesitate in getting your drain cleared. 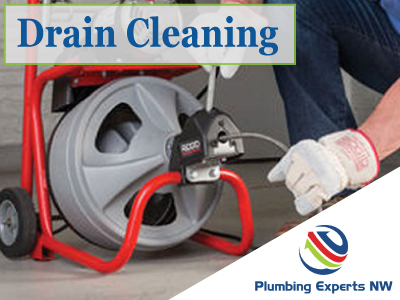 If you've run into a clogged drain or any type, then you'll want drain cleaning services from a company that responds fast and with the expertise to handle the problem the most efficiently. Plumbing Experts NW wants to show you how a pro handles your drain cleaning in Mill Creek---no more toying around with these clogs! With years of plumbing service expertise, we diagnose your drain clogs and come up with the best options for handling the problem. This is the level of drain cleaning Mill Creek WA families truly need. You're going to want a clear diagnosis and clear options, especially to keep some of these problems from re-occurring. We're prepared to be your drain cleaning and plumbing advisor, no matter what your situation requires. Rave Reviews of our Services for Drain Cleaning in Mill Creek! Plumbing Services in Mill Creek all your repair needs. Get our affordable plumbing service on the case today! Water leaks can come from anywhere. You need the issue located, identified, and fixed fast. Call on Plumbing Experts NW. Sewer lines are tricky, and we can help you SEE what's going on with a sewer video camera inspection, or sewer scope. Having issues with your hot water tank? We fix problems or replace your hot water heater. We have tankless water heaters too! Drain Cleaning Mill Creek families will need. Whether it's sewer line clogs or in-house drains or fixtures. We clear clogs in Sewers and handle sewer repair in Mill Creek WA, when there's a larger issue.